This series was over before game four. However, the NBA fans are owed four games. It was an anti-climatic championship win. Everyone knew the outcome. 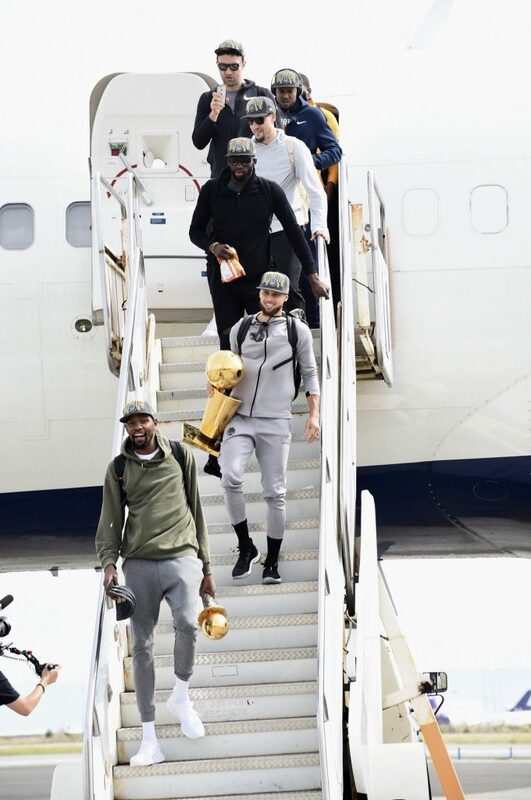 There is zero parody in the NBA; it is the super team warriors and everyone else. How do you knock off this dynasty owned by the Golden State Warriors? The Rockets were close then Chris Paul was injured in game five. Cavaliers punched them in game one. J.R. Smith ran the opposite direction after the rebound, barely hurting the Warriors. Now the summer of LeBron is upon us, part two. And the Warriors sit on his throne, celebrating. Stephen Curry scored 37 points, Kevin Durant added a triple-double and named NBA Finals MVP for the second time. The Warriors won their second straight title and third in four years, 108-85 over the Cleveland Cavaliers to complete a sweep and even possibly sweep LeBron James from Cleveland again to chase championships. Here is a thought, the Warriors became the second team in league history to sweep the NBA Finals with all four wins by at least eight points joining the Milwaukee Bucks in 1970. The Warriors plus 60 scoring margin is the most ever for a Finals sweep. The Warriors will not land on Earth, until a team brings them down. Early in the first quarter, Curry shot a wild three while trying to draw a foul on J.R. Smith; Curry connected on the shot, it was fair to say bring the brooms out. Golden State became the ninth team to sweep the finals. Curry made a 3-pointer in his record 90th consecutive postseason game and extended his mark for 3s in road playoff games to 44. The Warriors as a team are not my preseason favorite, instead my summer favorite to win it all next season, no matter the team LeBron signs with next season. They are on another planet with no indication of them landing on planet earth soon. With Durant expected to re-sign with them in weeks and Curry, Thompson, Green and the rest still young and hungry, back to earth can last a while. 4200 men have played NBA basketball, 73 have won three championships or more, that is less than two percent. Five of those 73 men play for the Warriors. The Cavaliers go where LeBron goes. James averaged 34 points, 8.5 rebounds and ten assists in the series, but as has been the case in the past, he didn’t have enough help. The 33-year-old, who returned to the Cavs and ended the city’s 52-year championship drought in 2016, is expected to opt out of his $35.6 million contract and become a free agent. James arrived at his postgame news conference with a large black brace on his right hand and explained the injury was “self-inflicted” after the game one overtime, which included a reversed official’s call and teammate J.R. Smith dribbling out the clock to end regulation. James allegedly played the last three games with a broken hand. James scored 748 points in the playoffs, the second most in a postseason behind Jordan, who scored 759 in 1992. Also, James averaged 34 points in his 13th postseason, his second-highest total. What will LeBron do? Only LeBron knows, what will the NBA do to stop the Warriors? No one knows. But Golden State will be ready.